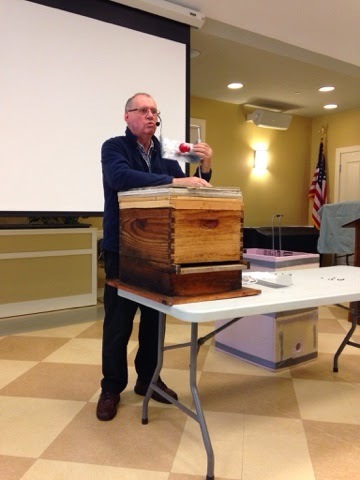 At our local beekeeping club meeting, Alex Papp presented his approach to overwintering bees. I feel like I should preface this post by saying that from a personal perspective, I disagree with much of what he said, and I'm not going to repeat it. I don't think he's wrong or bad. Actually, I think he has a very kind heart for his bees and is doing what he feels is best. We just have widely different perspectives. By his own admission, he views his bees as pets, and I want mine to remain wild creatures. He believes in a regimented approach that is strictly timed to the calendar. I believe in watching nature and taking cues from what I see happening. He treats and feeds on a schedule whether the bees need it or not. I don't. He said his primary focus is honey. Mine is not. 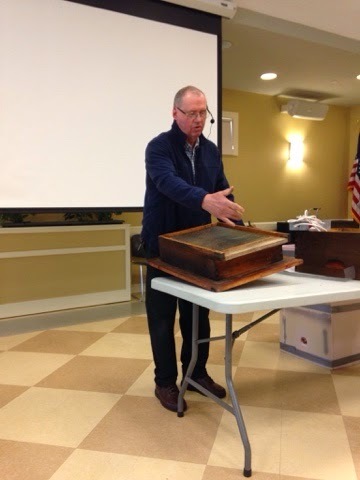 However, he shared a unique and novel way to keep his hives warm over the winter. As we come out of a grueling winter, that seems to be the thing on everyone's mind, so I thought I'd share. Screened bottom board with a solid bottom. The screened bottom board has a removable tray that can be greased and used for varroa counts. It's deeper than a normal screened bottom board so that it can accommodate a lightbulb in winter. The back of the screened board has a door in back that uses a screened cover in summer and a solid one in winter. The solid door is notched so that the cord for the bulb can slip through. 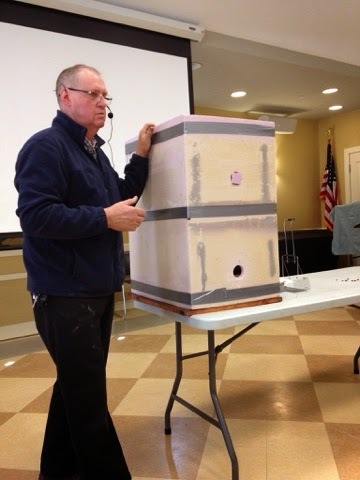 The dimensions of the waterproofed solid bottom are bigger than the hive so that a foam insulator can fit on top, but more about that in a minute. Lightbulb. During the winter, Alex inserts a 25-watt lightbulb with a ceramic socket into the tray for the screened bottom. He says one could also use a 15- or 40-watt bulb depending on factors like wind or temperatures, but 25 watts work for him.) The lightbulb and socket are attached to a piece of metal that is sort of C-shaped. He puts it into the hive lightbulb down. This way the bulb doesn't get dirty with cappings and whatnot that fall. Also, he covers the metal with aluminum foil for easy spring cleanup. Additionally, the metal radiates heat from the bulb. The lightbulb is painted red because bees don't see red. He turns the light on whenever temperatures drop below 40 degrees F.
Entrance and 2 Deep Brood Boxes. These go on the bottom just like normal. The entrance is reduced to 2". 1 1/2" shim. The shim provides space for 5 large fondant patties/pollen patties. Homosote board with 2" hole in the center. The homosote board absorbs moisture. The hole provides ventilation. Screened board. This enables him to look down the hole to check on the patties and bees. He says that he checks his bees in in -10F weather. Newspaper. A layer of newspaper covers the center of the screen, but he leaves 1" uncovered around the corners of the screen. Homosote board. Another homosote board goes on top. Foam insulation. A box made of foam insulation goes all around the hive. It sits on top of the solid bottom board so that it never touches the ground. It has two holes that allow for ventilation. The bottom hole is near the entrance so that bees can come and go. Alex also uses this hole to check the lightbulb (in case it needs to be changed). The top hole sits just below the top of the hive. Sometime he uses a square plug made of foam. The square does not completely fill the circle, so it slows down warm air loss rather than stopping it completely. Board and Plastic. The whole thing is topped by a board and a plastic sheet. The board keeps it from flying away, and the plastic keeps everything dry. Screened and solid bottom. You can see how the solid bottom is larger. Foam insulator. You can see the plug in the top hole. He claims that his bees never cluster during the winter. As a result, they never slow down, and the queen doesn't stop laying. By the time spring arrives, he has a massive population. When the black locust blooms in May, his hives are bringing in 30 lbs of honey per week. He harvests 3 times per year, and he gets about 120 lbs per hive. He says that by keeping their bees alive, northern beeks take the pressure off the package industry to produce low quality bees. Additionally, it reduces the importation of pests that travel with packages. He provided a lot of other info on his feeding and treatment practices, but I'm going to skip that. I was told that Al Avitable did a write-up of this approach for the January issue of The American Bee Journal, so if you subscribe, you could read that article. I'm not sure that I would ever use this approach. However, I'm always impressed by the creative problem-solving skills demonstrated by beekeepers in the face of adversity. When I've talked about hoping my bees make it through winter, people say, "Can't you put a light bulb or heater in there to keep them warm?". I'm with you that I want my bees to survive with minimal intervention. I'd rather have bees that can overwinter by themselves and sustain themselves on the available forage than artificially prop up weaker bees. I sort of agree with your opinion, but I am also persuaded by the article premise that it is better to keep the bees alive rather than continue he cycle of buying bees from around th world each year to replace winter dead-outs and continuing to spread deseases and parasites to parts of the world that has not had time to build up natural eco defences against them. Each to his own, but I prefer to keep my bees a live rather than buy new bees each year. If this means I take no honey, or havevto insulate them against a particularly bad winter I do so. Server always Beeks near me disagree, preferring to extract the maximum honey and restocking each year as it makes more money. This is not why I got into Bee Keeping. Thank you very much for posting the article. To be honest, I would probably never do what Alex does for a number of reasons. For starters, I don't want to have to feed all winter and treat for mites. Also, it must really wear out queens super fast when they have to keep laying all winter. Maybe, if I had a colony that was struggling in winter due to no fault of its own -- say a bear attack or something -- I might try using a light bulb. But under normal circumstances, never. However, I thought his strategy was also something really novel, so I wanted to share. Thank you for your comment! I can't wait to hear what you think! Please, check out my other blog!